Opening the Dining Room into the existing Kitchen provided for the high impact Kitchen the Owners desired. Renovating just one room touched four rooms at the first floor, the main Entry Hall, Kitchen, Dining Room and Den. The brick chimney became the focal point of the design with a large central island surrounding the exposed brick masonry. With a major supporting wall removed, the contractor, Palmetto Craftsman, installed large heartpine beams with exposed structural bolts to support the second floor. Quality custom cabinets topped with honed granite worked well in the high traffic area for the family of 5. Providing an opening to the Den allowed for the preparation of dinner while the children sat at the counter completing their homework. The design of this Kitchen was the first of two projects completed for the Owner by Clark-Glidewell/Architect. (Refer to Sayle Street for second project) Photography by Margaret Wood-Atwood. Designing a "spa like atmosphere" was a request from this client located on a large wooded lot in the quaint town of Summerville. An addition was needed to meet all the requested requirements from a private tub and extra large shower to a makeup area located within a bay window. Custom details were completed by the contractor, Burgreen Construction, including a bamboo dividing wall at the toilet area to a circular window with a view to the woods beyond. Also included in this design was the enclosure of a open porch to a Sunroom with a small fireplace at the interior and permanent grille at the exterior. Small but effective modifications to the simple Kitchen were also completed. The simply designed addition, when covered in vines to match the house, will blend well with the Spanish Revival 1940's home. Photography by Margaret Wood-Atwood. Multiple design options were provided for the Kitchen of this Victorian home, but eventually it was determined that even though the Kitchen appeared large, a 4' addition had to be constructed, to accommodate the existing window and door locations. Custom high quality cabinets with book matched doors were constructed on either side of the brick chimney. The cabinet design was thoughtful of the Victorian era house and hid the appliances that would not have been in existence at the time of the original construction. 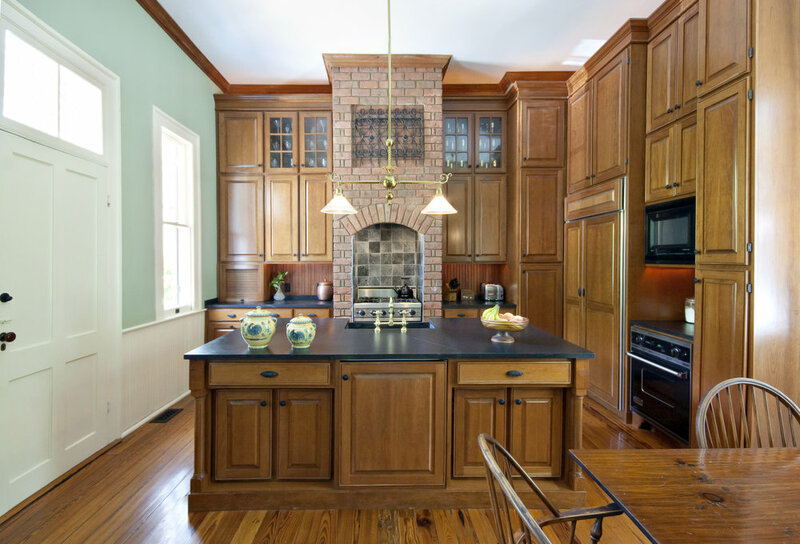 Soapstone counters, sink and range surround were shipped directly from Vermont as this product hadn't been used in Charleston until the creation of this Kitchen. A small desk area with hidden drawers for children's backpacks was designed in the corner. This is the first project of two that Clark-Glidewell/Architect designed for the client. A beach house, constructed by Walters Construction, on Edisto Island was the second project.